Book two of a new series featuring After worldwide fan-favorite Landon Gibson as he leaves Washington to navigate love and life in New York City. At the end of the After Ever Happy, Landon got married—but readers everywhere have been wondering who will get to call the nicest boy in the After series their forever love? 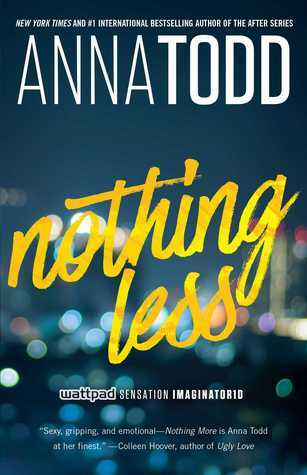 I’m not a big fan of Anna Todd’s books (I think she’s a really cool person though). I really hated After but I thought Nothing More was a lot better compared to After. I still didn’t like Nothing More but there was so much improvement in the writing. I didn’t plan on reading Nothing Less but the publisher sent me an unsolicited copy and I felt bad not reading it. I am pleasantly surprised to report that I thought there was even more improvement in the writing. I don’t know if it was just because the plot was a bit different from Nothing More or I’m just slowing getting used to the writing style but I didn’t hate this book. I didn’t like it, but I didn’t hate it. I thought it was pretty good compared to After. If you’re a fan of Anna Todd’s books or Fifty Shades of Gray, I’d definitely say check out the Landon Gibson series. I think it’s miles above After and I don’t think it’s a complete waste of time. But if you haven’t read Anna’s books, if you’re even remotely a critical reader, I wouldn’t recommend this series. Previous Previous post: Coffee Book Tag!